minutes from the June Meeting. suggested was October 8, 2016. We would make BBQ sandwiches that were pre­sold. motion made and seconded for members to attend and display items if they wanted to. have appear in the News Letter. year. Please think about it. Activities. There was a lot of participation in the activities. does all our auctions. It was seconded and approved. entertainment is asked to perform. September 24, 2016. International Tractors will be featured. ● The meeting was adjourned. The blessing for the meal was given by Tom Weaver. A message from Kaye (Wonderley) Butler: My Dad, Bill Wonderley, was an avid tractor puller from its early days. He started pulling at Rockingham County Fair with farm tractors in, I believe, 1969. 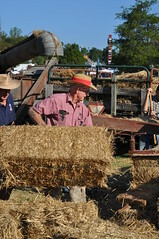 I think his last pull was around the year 2000, when he was in his mid-seventies! He won many, many trophies, and with his Shenandoah Wonder, he was Virginia state points champion in both the 5,500 and 7,500 lb. classes. He passed away last August just before his 90th birthday. *Farm Auction to be held on Saturday, October 15, beginning at 8 AM. Location is 10024 Jacksons Way, Port Republic. The farm is 2 miles north of Port Republic, and Jacksons Way runs parallel to US 340 between Port Republic and Lynnwood along the south fork of the Shenandoah River. The auctioneer is Charlie Whetzel, and yes, he plans to promote the auction on the internet. I assume it will be on auctionzip, if that is the site he normally uses. 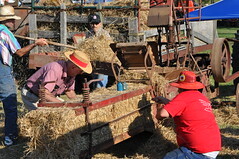 The auction will include household furnishings and farm equipment. We have several vintage tractors that will be auctioned. 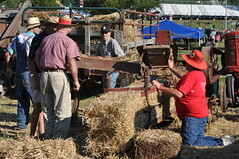 They are subject to sale prior to the auction, so folks should check the website to see what tractors will be included. Charlie says he usually advertises about two weeks before the auction. My email address is kayebutler@gmail.com, and interested parties should feel free to contact me for more information. IH Model 560 with front loader (homemade bucket) in fair condition. IH Farmall “M”. It runs but is in fair/poor condition. IH Model 460. It is disassembled; we have all parts in hand. IH Farmall “H” with homemade road scraper blade. It runs with some help and is in fair condition. IH Farmall Model “Super M” with mounted sickle bar mower. Has C281 engine, which is the biggest stock engine for that tractor. Condition fair. IH Farmall 460, “The Shenandoah Wonder”. It was a Virginia state champion alcohol/turbo pulling tractor with two additional mounted tires and aluminum rims. Condition fair. We have quite a few tractor weights, both wheel weights and (homemade) suitcase weights.